DETROIT (Reuters) -- General Motors is preparing to put its full-sized pickup trucks on a severe diet to meet future U.S. fuel economy standards and stay competitive with rival Ford Motor Co., according to several people familiar with its plans. But GM likely won't be able to implement an extensive weight reduction program until the just-redesigned Chevrolet Silverado and GMC Sierra are overhauled again in 2019, according to supplier sources. That is five years after Ford plans to slash at least 700 lbs from its best-selling F-150 pickup as part of a fall 2014 redesign. More efficient engines and transmissions will help reduce fuel consumption on the big GM and Ford trucks, but the biggest gains are likely to come from shedding weight. 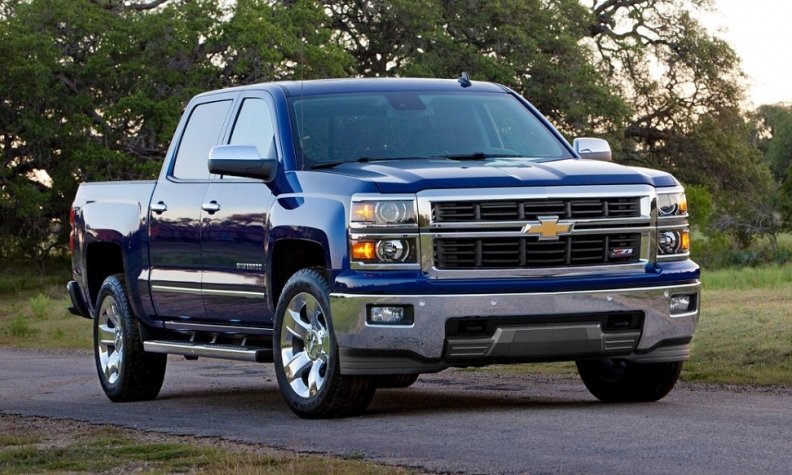 Even though GM's 2014 Silverado and Sierra lost between 250 to 400 pounds as part of a complete makeover this summer, the lightest Silverado still tips the scale at 4,387 pounds. GM "didn't go far enough in terms of weight reduction and powertrain improvements" when it developed the 2014 Silverado and Sierra, according to an industry consultant who works directly with the U.S. automakers. Now, he said, the automaker has no choice, but to "send 'em to Jenny Craig" -- a reference to the popular consumer diet and weight-loss program. Prior to the 2019 launch of the next-generation Silverado and Sierra, GM is planning a series of rolling changes over the next few years to the trucks, which just went on sale six weeks ago as redesigned 2014 models. GM will begin to use more lightweight materials such as aluminum and composites, in place of conventional steel, several suppliers said. The moves are designed to help protect what executives have sometimes described as the "crown jewels." The high-volume truck models generate handsome per-vehicle profits of $12,000 or more. Together, the GM and Ford pickups account for nearly 10 percent of total U.S. vehicle sales. "We're going to look at all the levers we can pull -- materials, aerodynamics, powertrain -- to continue to improve fuel efficiency, both on an interim basis and as we go to the next-generation trucks," GM spokesman Tom Wilkinson said. He declined to discuss the automaker's specific plans. One supplier source said GM plans to introduce late next year a special aluminum-intensive version of the Silverado that could be up to 250 pounds lighter, with 20-percent better fuel economy. A second supplier source said GM is working with several parts makers to redesign such underbody components as springs, axles and driveshafts on the pickups to reduce their weight. A third source said GM is considering following Ford's lead in using aluminum and composites on such major truck body panels as doors and fenders, but that it likely will trail Ford "by years" in implementing such sweeping and expensive design and engineering changes. "GM can make some changes (in materials) when the Silverado and Sierra get a mid-cycle freshening" in about three years, the source said. But GM may not be able to implement an extensive shift to aluminum until the next-generation trucks are ready toward the end of the decade, he said. Both GM and Ford are mindful that full-size truck customers don't want to sacrifice size, power, load carrying and towing capacity on their vehicles. But they also will have to meet tough new federal fuel economy standards that begin to escalate in 2017. Light trucks -- including car-based crossover vehicles -- will be required in model year 2017 to average about 29 miles per gallon. The standards will increase each year through 2025, when the projected light-truck requirement hits around 40 mpg. The "lightweighting" programs at Ford and GM are expected to prove a boon not just to traditional auto parts suppliers, but to major aluminum producers such as Alcoa Inc. and Novelis Inc.
Alcoa is the major provider of aluminum body panels on the 2015 Ford F-150, according to several supplier sources familiar with the program. The most recent trucks from GM and Ford feature aluminum hoods and experts say aluminum doors and other areas of the vehicle body are the next frontier. Alcoa said it expects to more than triple its sales of aluminum sheet to automakers by 2015.